Silver Screen Legend XVII is dedicated to legendary silversmith and leather craftsman Edward Bohlin. He was born in Sweden and came to this country as a young man to be a cowboy. He worked on ranches in Montana and Wyoming, learning to rope and ride. He was also learning how to repair saddles, bridles and other leather goods. He eventually started building saddles and related cowboy gear and learned silversmithing to decorate the saddles and bridles that he made. As the demand for his products grew, he opened a saddle shop in Cody, WY and turned full-time attention to his craft. Cowboy star Tom Mix saw his work and invited him to re-locate to Hollywood. Upon setting up shop in Hollywood, two of the first saddles he made were for popular Hollywood cowboy star, Buck Jones and his wife Odelle. Those saddles are now on display in the Autry National Center in Los Angeles. Bohlin’s reputation for making quality saddles and other leather goods grew and soon he was crafting exquisite silver mounted saddles, bridles, bits, spurs and holster rigs plus a complete line of accouterments for the riders of the Silver Screen. Many of the items made in his shop are now in museums or private collections. Some of his saddles and gunbelts can still be seen today in parades such as the Rose Parade. The Happy Trails Children’s Foundation is proud to honor Ed Bohlin this year with Silver Screen Legend XVII. This is the 17th year the foundation, through the generosity of the renowned Colt’s Manufacturing Co. LLC of Hartford, CT, has used very special guns and holsters to raise money for abused children. Renowned western entertainers Roy Rogers and Dale Evans spent a lifetime devoted to children and their support of children-at-risk is well documented. The Happy Trails Children’s Foundation is proud to carry on the work with abused children who were so important to Roy and Dale. However, we need your help! As a result of our association with Roy and Dale, and the positive and wholesome family values and American Traditions they represented, the Happy Trails Children’s Foundation is the only known children’s charity in the country today that actively supports shooting sports, Second Amendment Rights and responsible gun ownership, and is in turn supported by generous contributions from shooters, collectors, organized shooting sports and the firearms industry. We are proud of this unique partnership! Order your tickets today for this beautiful and unique museum quality one-of-a-kind cowboy collectible. Tickets are $10 each or 11 tickets for $100. The drawing will be held Saturday evening, December 13, 2014. YOU DO NOT NEED TO BE PRESENT TO WIN! The winner will be notified by phone. You may check our web site for the winner’s name, after the drawing. 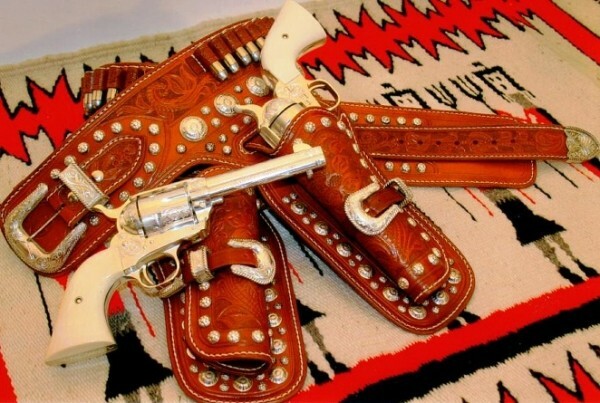 This entry was posted in Gear, Good Causes, Guns, History, Revolvers, Uncategorized and tagged .45 colt, Autry, Dale Rogers, Edward Bohlin, Happy Trails Children's Foundation, revolvers, Roy Rogers. Bookmark the permalink. What an awesome rig and what a great cause!